Belly fat or visceral fat may be caused due to the sedentary lifestyle and unhealthy eating and living habits. Within a very short time fats can accumulate in belly, but when you want to reduce belly fat, you have to put in lots of efforts. Belly fat can make you look unattractive and unhealthy. Excess belly fat may lead to various health issues and diseases like diabetes, heart diseases, and kidney problems. As I have already said, reducing belly fat is not easy, but it’s not impossible either. If you are determined and willing to put in the extra effort, you can easily reduce belly fat. What causes the belly fat? Usually, we blame it to the food and lack of exercise. When you are not eating right and you sleep till late hour or find no time to exercise, you may end up with excess belly fat or visceral fat. If you know what you are eating and how your body is absorbing it, it will help you get to the cause of excess belly fat. But all in all, it’s the food you eat and lack of exercise which is mostly responsible of excess belly fat. Eating right and adopting healthy living and eating habits can help you to prevent and reduce belly fat much effectively. The belly fat is stubborn and you have to really work on it to prevent and reduce it. Not just diet, but proper workout and exercise is equally important to get rid of the stubborn belly fats. 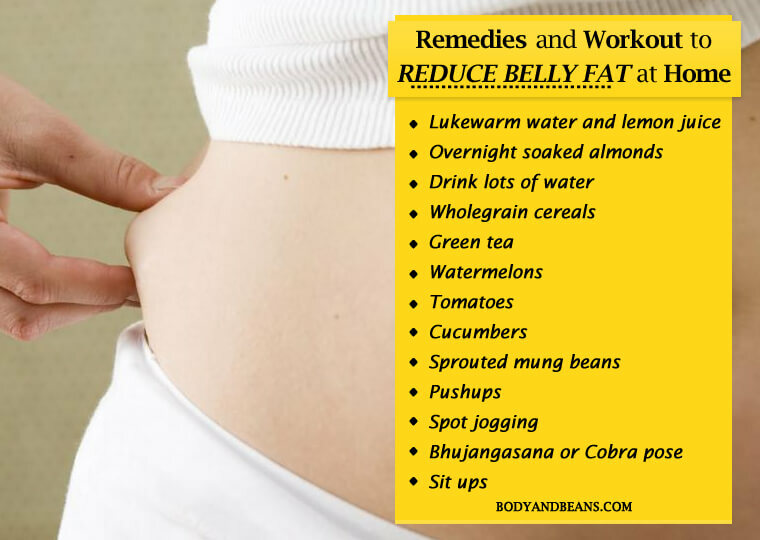 Apart from what you are already doing to reduce belly fat, here are some of the remedies that’ll help you reduce belly fat at home. This trick in early morning can surely help you to lose stubborn belly fat. The lukewarm water mixed with lime juice will work as a strong detoxifier which will not only help to burn the fats, but it’s also good for your skin. This drink will also keep you hydrated throughout the day. Wake up in the morning and drink this lukewarm water, lemon and honey mix in empty stomach. Take a glass of hot water, add one tablespoon of lime juice and stir well. If you cannot bear the taste of this mixture, you can add one teaspoon of raw honey into it. Drink it before breakfast, everyday to get rid of belly fat. Raw almonds are tasty nuts which will help you to lose the belly fats. Almonds are rich in magnesium, iron and vitamins and can be source of a complete nutrition. The almonds will help you to develop muscles, the more the muscles, the better you can burn the belly fat. 8-10 overnight soaked almonds can give you a energy boost, can shoot up your metabolism, and thus speed up the fat burning process. The almonds are heavy snacks and can keep you full for longer hours. Which means less food and that’s going to help you further in keeping the belly fat in check. Yes, you read me right. Plain water can help a great deal to burn the belly fat. Water is that magical drink that can benefit you in every possible way. Water will regulate your urine flow, toxins will be flushes out from your body, your bowel movements will be clear. Your skin will glow, your hair fall will be reduced and most importantly, water will burn the belly fats. Drink 6-7 liters of water in a day. Make sure that you are drinking two glasses of water before each meal. The water will keep you fuller, it will save you from the unwanted hunger pangs, you will eat less, and thus the belly fat will be reduced. Water also increases metabolism, another good reason behind burning of the belly fats. The whole grain cereals like oats, chapatti is better than white rice. The white rice contains starch and carbohydrates and can be easily digested by the liver. Another strong reason of belly fat is absorbing white rice daily in great quantity. The whole grain like cereals, oats, and wheat is better in this regard. Your body will work hard to digest the foods, and in doing so, huge amount of belly fat will be burnt. Substitute the white rice with whole grains, and you can notice the difference within a week. You are already aware of the hundreds of health benefits of green tea. Green tea is more effective then black tea or oolong tea when it comes to health. Green tea is an important drink which will help you to reach the fitness goals. Green tea contains catechin which will melt the fat cells by speeding up the digestion. You can have green tea 2-3 times a day, and you can avoid adding sugar to it. You can add honey, or buy honey flavored green tea for taste. Watermelons contain 95% water, and thus a great summer fruit. It will soothe your hunger, keep your body hydrated and save you from all the junk foods. When you are hungry, grab a slice of red juicy watermelon and enjoy your food. Watermelons contain vitamins, potassium and magnesium, hence a healthy food for you. Scholars in University of Kentucky pointed out that taking watermelon juice twice a day for 8 weeks can reduce belly fat to a great extent. Drink melon juice before meal, and hence consume lesser fat. One large tomato has just 33 calories, and this vegetable can help you in weight loss. Tomatoes are rich in a compound called lycopene, which are powerful antioxidants and can prevent several diseases like diabetes, obesity and kidney problems. You can include tomatoes in your daily diet in both raw and cooked form and see your waistline reducing. Just like the water melons, cucumbers are rich in water, which make it a perfect summer fruit. Cucumbers are rich in vitamins and minerals which will release the toxins from your body, will help in smooth digestion, will hydrate your body and will also help you lose belly fat. 100 grams of cucumber will have 45 calories, and this makes it ideal food for you. Have cucumbers daily in your salads and you will feel fuller. Sprouted moong or mung beans can seriously help you in losing belly fat and overall body weight. It’s a complete nutrition in itself, rich in fiber and other essential nutrients and has less calories. Eat a bowl of sprouted mung beans salad every morning in breakfast and see the magic. Wash the sprouted beans; add diced tomatoes, green chilies, lemon and dress with a pinch of salt and you are sorted. Not only diet, but physical exercise will play a vital role in losing your belly fat, and we will look in to it in the next section. 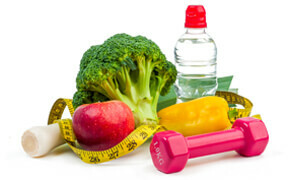 As you already know, eating right and proper workout is essential to maintain good health and proper body shape. We have already discussed some of the best foods that can help you to prevent and lose belly fat. But in order to reduce belly fat at home, you have to do some light workout like some cardio, push ups, crunches, lunges and some Yoga asanas. Doing these daily for 30 minutes followed by properly balanced and nutritious diet can certainly help you reduce belly fat within a few weeks. Here are some of the most effective and simple workout you can do to get rid of belly fat. Lie down on the floor with your belly touching the floors. Now lift your body up, giving strength on your hands and legs. Doing this will release heavy pressure on your stomach, which will reduce belly fat. 10 push ups daily can do the trick. Here’s a YouTube video you may like to check. Keep on jogging on the same spot for two minutes at a stretch. Pause for 30 seconds, and then do another round for two minutes. You will sweat profusely. You will see that your belly is sweating too. Spot jogging is very essential if you want to reduce belly fat. Lie on the floor with your belly down; keep both hands beside your chest and lift the upper part of the body. Hold for 30 seconds, and do three rounds like this. While you are doing this, you will see that you are straining your belly to an extreme and this will help you to lose the belly fat. Here’s a youtube video you may like to check. Sit ups will help to lose belly fat because you are giving pressure on your belly while doing it. Sit straight and stretch your legs in front. Raise your hands above, and try to touch the toe with your fingers. Do not fold the knees. Repeat it 20 times for best results. You can include fresh fruits and vegetables in your daily diet and enjoy good health. Change your food habits and preferences if you want to lose weight. When you are feeling hungry, instead of grabbing a burger, you can have few almonds and one whole apple. These minor changes will help you to lose belly fat within no time. Breakfast like king, lunch like prince and dinner like pauper, as the proverb says. This proverb is well-known because this could well become the mantra to maintain a fit body. Losing belly fat may seem impossible at first, but nothing is impossible if you are serious about it. If you want to get the desired shape, then you have to work for it, there is no excuse to it. If you religiously follow the diet and the workout plan, then you will be able to reduce belly fat easily at home. How do you maintain your body weight? What’s your diet and exercise plan to reduce belly fat? Sir, i want to gain weight mostly in my belly region as I’m very thin and people make fun when I’m around. Please guide me Sir. Thank you.